These install instructions assume you are going to be using a newer version of Ubuntu, or another Debian based Linux distribution. I’m also making the assumption you already have InfluxDB installed and configured. Install NET-SNMP and some basic SNMP MIB’s. By default NET-SNMP will look in several locations for MIB files, including the folder shown above. The result above shows us the Battery Run time remaining in ticks. If you encounter any kind of error, check to make sure all the above packages are installed, and you have everything in the right directories. If you got a result, great, Let’s move on! Configure the Telegraf conf file for grabbing data from our APC unit with SNMP. [[inputs.snmp]] agents = [ "192.168.99.138" ] ## Timeout for each SNMP query. timeout = "30s" ## Number of retries to attempt within timeout. retries = 3 ## SNMP version, values can be 1, 2, or 3 version = 2 # hostname ovveride name_override = "ups" # ## SNMP community string. community = "public"
# ## SNMP community string. 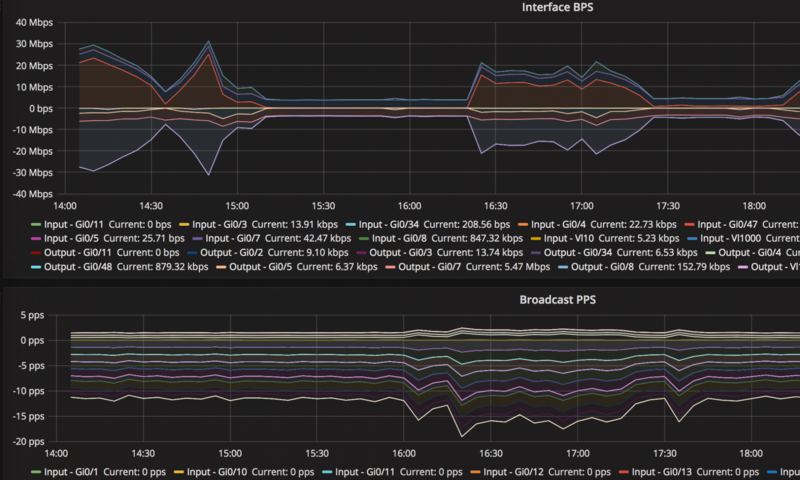 This will give us output of the data that it’s collected, and what will be pushed to InfluxDB in the “UPS” measurement. If you don’t have this output, go back and make sure you aren’t missing any steps. Confirm it’s working and graph your data! You can view a live demo of the template here. really thanks for your code and dashboard – I use it too for my 2 UPS & I can confirm it works great. I have some other smaller APC too and was thinking to maybe get this also running on the same dashboard via a USB connected Raspberry pi. Already tested around and there is a tool called “apcupsd” what output the values – so need only a connection to snmp.